Ludwig van Beethoven (baptized 17 December 1770 – 26 March 1827) was a German composer and pianist. A crucial figure in the transition between the Classical and Romantic eras in Western art music, he remains one of the most famous and influential of all composers. 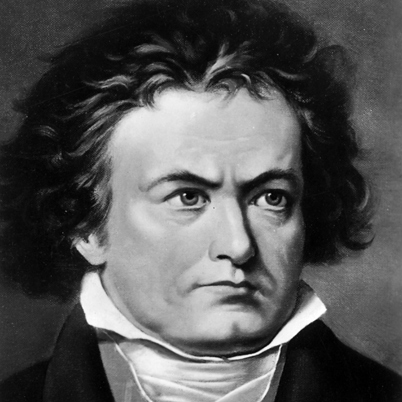 His best known compositions include 9 symphonies, 5 concertos for piano, 32 piano sonatas, and 16 string quartets. He also composed other chamber music, choral works (including the celebrated Missa Solemnis), and songs. Born in Bonn, then the capital of the Electorate of Cologne and part of the Holy Roman Empire, Beethoven displayed his musical talents at an early age and was taught by his father Johann van Beethoven and Christian Gottlob Neefe. During his first 22 years in Bonn, Beethoven intended to study with Wolfgang Amadeus Mozart and befriended Joseph Haydn. Beethoven moved to Vienna in 1792 and began studying with Haydn, quickly gaining a reputation as a virtuoso pianist. He lived in Vienna until his death. During the late 18th century, his hearing began to deteriorate significantly, yet he continued to compose, conduct, and perform after becoming completely deaf. 1431 – Henry VI of England is crowned King of France at Notre Dame in Paris, France. 1598 – Seven Year War: Battle of Noryang – The final battle of the Seven Year War is fought between the China and the Korean Allied Forces and Japanese navies, resulting in a decisive Allied Forces victory. 1850 – History of New Zealand: The Charlotte Jane and the Randolph bring the first of the Canterbury Pilgrims to Lyttelton, New Zealand. 1864 – American Civil War: Franklin–Nashville Campaign – Battle of Nashville – Major General George Thomas's Union forces defeat Lieutenant General John Bell Hood's Confederate Army of Tennessee. 1912 – First Balkan War: The Battle of Elli takes place. 1960 – 1960 New York air disaster: While approaching New York, New York's Idlewild Airport, a United Airlines Douglas DC-8 collides with a TWA Lockheed Super Constellation in a blinding snowstorm over Staten Island, killing 134. 1971 – Bangladesh Liberation War and Indo-Pakistani War of 1971: The surrender of the Pakistan Army brings an end to both conflicts. 1972 – Vietnam War: Henry Kissinger announces that North Vietnam has left private peace negotiations, in Paris, France. 1972 – Vijay Diwas: (Victory Day) is commemorated every 16 December in India as it marks its military victory over Pakistan in 1971 during the Indo-Pakistani War of 1971. 1985 – Mafia: In New York, New York, Paul Castellano and Thomas Bilotti are shot dead on the orders of John Gotti, who assumes leadership of the Gambino family. 1989 – Protests break out in Timi?oara, Romania in response to an attempt by the government to evict dissident Hungarian pastor László Tokés. 1991 – Independence of Kazakhstan.